In the Montane forests of Knysna, we have many shy and elusive forest residents that are seldom seen or heard. The small-spotted genet (Genetta genetta), is a secretive, nocturnal species, inhabiting rocky terrain with caves, dense scrub land, forests, and marshland. This handsome, feline-looking animal has a pale grey and black spotted coat, with a long striped tail. 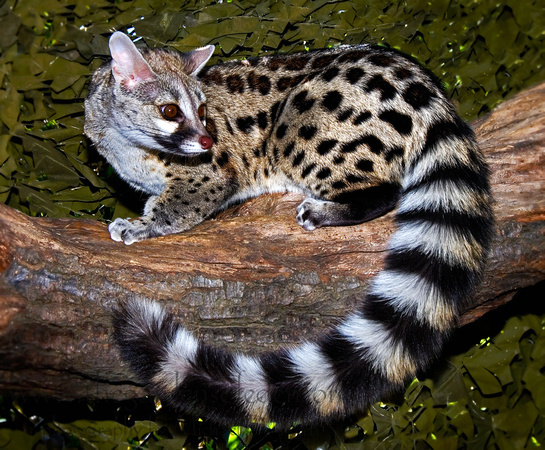 Like all genets, it has a small head, large ears and eyes, and short legs with retractable claws. Males are larger than females, and juveniles are darker grey. The genet has a varied diet that consists of small mammals, lizards, birds, amphibians, insects and even fruit. Rodents are a favourite prey and so are lizards, but being expert climbers, they also prey on squirrels, birds and dormice. Genets kill with a bite to the neck, like cats. This species is sometimes kept as an exotic pet by humans as they aid in keeping vermin populations in check, especially in areas where crops can be negatively affected by pests. Genets sometimes eat poultry and game birds; however, most humans do not consider genets to be a threat. Genets are also currently in no danger of becoming endangered, as they are listed under least concern on the Red Endangered list. This entry was posted in Eco awareness, Forest mammals, From the Phantom Forest and tagged Elusive forest fauna. Bookmark the permalink. ← Go Organic ~ it’s healthy for your family and our earth!